AT&T is encouraging mobile phone users to get used to typing full messages rather than use acronyms and text speak at “Speak in Thumbs“, today’s site of the day. 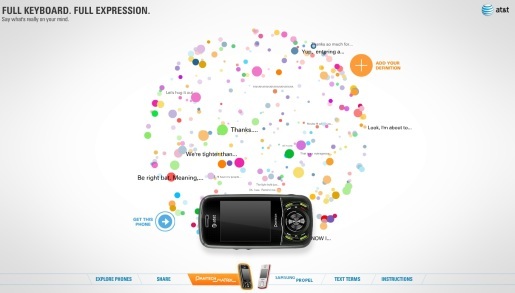 Speak in Thumbs, at www.speakinthumbs.com, promotes the Pantech Matrix and Samsung Propel mobile devices, each with full keyboards. Visitors to the site are urged to properly state what’s on their mind in an ear typically saturated with shortened words and acronyms. They’re invited to type in their definitions of popular acronyms such as LOL, OMG, THX, BFF and TTYL, becoming part of the globe of definitions and expressions. AT&T Speak in Thumbs was developed at Atmosphere BBDO by chief creative officer Andreas Combuechen, creative director Arturo Aranda, associate creative directors Ron Lent and Mark Radcliffe, art director Jake Blumenau, senior copywriter Kim Mok, senior designer Lat Choi, associate director of production Heather Steinberg, senior producer Carrie Sampson, lead producer Ivan Corsa, senior information architect Lorenzo Colasante, technical lead Josh Dreier, with interactive production done at Firstborn Multimedia.